But it was a real winter, like the winters of my boyhood, when I spent hours sliding in the snow, skating on the ice, building snowmen and snow forts, and engaging in long snowball fights with friends. We didn’t stop until we were wet, cold, hungry, and someone called us in for dinner. We shucked the wet clothes and were fussed over and given warm dinner and warm drinks. I never wanted winter to end. And I discovered that after everyone else believed it had, we often got another storm, often close to St. Patrick’s Day. Many years, I annoy folks by predicting we’ll have a St. Patrick’s Day blizzard. And we often do, though maybe it’s a few days early or even a few days late. This year, it was early. Well, we think it was, but maybe another storm is on its way. Don’t tell my doctor, but I still like shoveling. Don’t worry. I take it easy. But handling that beautiful white stuff kind of takes me back to the joys of being young, when snow was like a huge set of toys being delivered to all the yards and playgrounds in my neighborhood. Don’t get me wrong. I love spring, and I look forward to it. I like it best when it takes its time developing, and each day is another gem of budding, new life. I enjoy each day of summer and each day of fall, too. And I make the best of winter, but I don’t expect it to end until after the leprechaun sings. 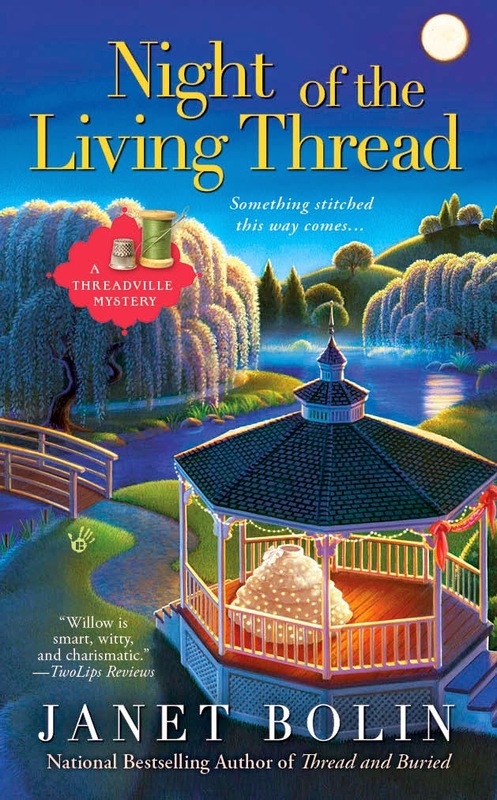 Janet Bolin’s fourth Threadville Mystery, NIGHT OF THE LIVING THREAD, features a Halloween crafts fair, a convention of zombies, and a killer wedding gown... It will be on shelves on June 3, 2014. Pre-order it from these booksellers. The first Threadville Mystery, DIRE THREADS, was nominated for both an Agatha Award for Best First novel and for the 2012 Bony Blithe Award. The second in the series, THREADED FOR TROUBLE, was nominated for the 2013 Bony Blithe Award. The third Threadville Mystery, THREAD AND BURIED, was a National Bestseller. Happy St. Pat's Day. I, too, love to make a snowman, but I really do love the freshness of spring. I think that's my favorite time of year. A little shake up on St. Patrick's Day in the form of an earthquake (ah, yes, I'm in California, far away from your lovely little town) is also something one will never forget. :) Shakes out the cobwebs. I think I might prefer the blizzard, Jenna. Dear Dr. Wrinklesides, I wish you a very Happy St. Patrick's Day. I might have delivered fresh cupcakes or lovely warm muffins, but when I pulled out into the street, my tires wouldn't do anything but spin on the ice. Cars slipped and slid and spun until the street looked like a disaster area. Now half my car is in a snow bank. I'm hoping the other half doesn't get creamed by someone driving down the street. My quaint but charming old plumbing burst in the back of the house, so now I have two new water features, a lake in the house and a skating rink in the back yard. The neighborhood kids built forts. So cute! Until two wayward ice balls hit my windows. Now I have air conditioning. A truck slammed into a tree and a huge limb of ice fell on a power line. Now I have candlelight. Has the leprechaun sung yet? Dr. Winklesides, I couldn't agree more about this being a real winter. On the year I was born, there was snow up to the bottoms of our windows here in Delaware. I love snow. I always have. So this winter has made me very happy indeed! Now, if I could just get it to show when I'm doing my Christmas shopping and so we could have a white Christmas, it would be perfect!